You are at:Home»Articles»How can academics contribute to tackling disinformation? How can academics contribute to tackling disinformation? 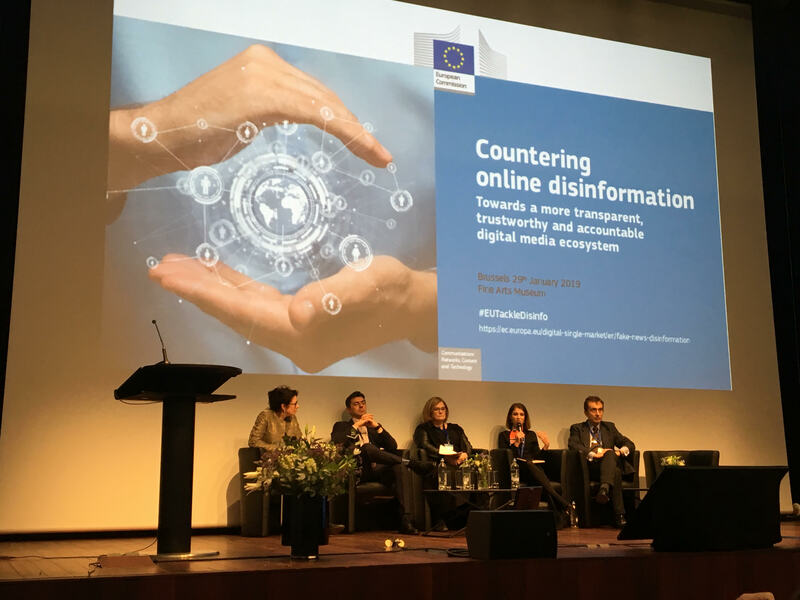 This week the European Commission hosted a day-long conference on Countering Online Disinformation which featured the Director of the FuJo Institute, Dr Jane Suiter. The panel discussed how academic research can contribute to a better understanding of disinformation patterns. Introducing the FuJo Institute Dr Suiter described how the cross-disciplinarity membership draws on social, political and computer sciences as well as engineering and humanities to research the most critical issues facing journalism, media and citizens and society. There is a particular interest in developing research projects that address the need for a vibrant public sphere. Right now, the focus is on re-establishing trust in credible information sources such as journalism and news media. But this is not to say that it is about trusting authority figures. “We should expect some rise in distrust which would grow alongside rising education levels. Because people learn to ask questions and not to be so trusting without thinking about it. We don’t want a society where everyone completely trusted everything they are told by the media or the government. We need societies where people ask questions and have some levels of distrust,” she said. Drawing attention to the need to find new ways to measure trust, Dr Suiter said that by relying on simple survey methods such as the World Values Survey which ask whether an individual trusts the media or not, is problematic. “We don’t really know what people mean when they answer that they do trust or they don’t. Do they trust them to be reliable? To be accurate?,” she asked. The work of cognitive scientists could be particularly informative for developing new systems of measurement she added. Dr Suiter argues the solution to falling trust is not to ask people to trust more but to enable them to measure the quality of the information they receive. To this end, FuJo is leading PROVENANCE, a project that will enable digital media users to trace the origin and manipulation of the content they receive. “It is a tool that will find content at the pre-viral stage, loaded into a blockchain and records its journey around the internet. It will also track manipulation. In the end, a user will be able to identify the origin, route and manipulation of material and make the decisions regarding trustworthiness by themselves,” she said. “We are not telling people that this information is good, or bad, correct or incorrect. We are showing people this is where it came from and the extent it has been manipulated. It is important to let people make the decisions. You cannot say to people that you have to trust us, you have to enable them to measure the trustworthiness of the content they get,” she added. Critical to the development of these types of tools are databases. Training the algorithm requires a large dataset of original and manipulated images. These are databases that the platform social media companies hold and could support researchers by providing access. But neither the problem nor the solution is entirely technological. Dr Suiter discussed the need to develop more resilient citizens and societies through cultivating healthy political and social discourses. Citing examples of the citizens’ assemblies and constitutional conventions in Ireland leading to marriage equality and better health care for women, which she researched, she addressed the need for people to be able to be enabled to deliberate, ask questions and challenge ideas respectfully. In addition, she stressed there is a need to find measures to support quality journalism. Finishing up, Dr Suiter stressed the need for better cooperation between digital platforms and the research community as well as recognition of how the proactive and predictive nature of academic work can help support citizens and media in a rapidly evolving environment. A recording of the conference can be watched here, with the panel beginning at 7.30.